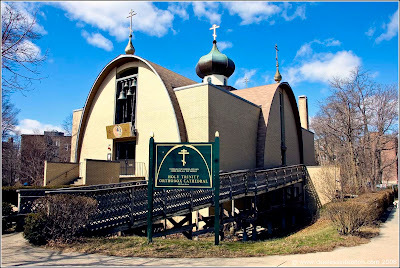 Holy Trinity Orthodox Cathedral on Park Drive in the Fenway. Wow. Stunning church, jumps out at you. Great photo, as always! Wow, again. I just noticed the link to my site. Thank you!!!! I really like the curves in this building. Quite unique, I'd think. Also the way they've echoed that design element in their sign. Very effective ... and a very well composed and rendered photo! Wow! That's a very unique shape for a church. Thanks for sharing this. Lovely picture, havent seen many building with such unique architecture.